While I've been writing many posts about London, I've never properly introduced you to Antwerp, 'my' city. While I was in Belgium last week, I spent the day in Antwerp with my sister for a sample sale and I took loads of photos. Have a seat and grab a drink, this is going to be a LONG post! Before heading to the sample sale, we wanted some food and couldn't resist going to Desiré de Lille. Here you get the best 'oliebollen', also called 'smoutebollen', which are fried doughballs covered in icing sugar. There's a restaurant down the street and take-away service on the corner, opposite the oldest skyscraper in Europe, Boerentoren. If you fancy something else try the waffles, just as delicious. A must when you're in Antwerp! On our way to the sample sale, we passed the cathedral, which is a beautiful and iconic part of Antwerp. With it's 123 meters, it's the highest church tower in the Benelux. Around this cathedral, you'll find yourself in the old part of the city. We then walked to De Grote Markt (the town square) where you'll see the huge city hall and the famous fountain of Brabo throwing a hand (on the left) which refers to the legend about the origin of the city name Antwerp. 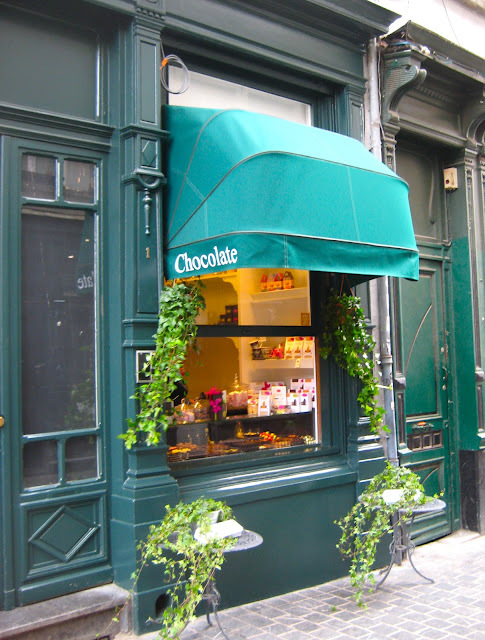 I can't show Belgium without showing a chocolate shop, right? Very touristy as it says 'chocolate' in English. You can find really great chocolates at Del Rey or Pierre Marcolini. But there are chocolate shops dotted around the city and I don't think any of them have particularly bad chocolate. Even though a lot of old buildings and houses in the old town got demolished, there are still some standing strong. We suddenly found ourselves in the red light district. Not the most charming part of the city so we moved on quickly and got to one of Antwerp's newer cultural attractions: het MAS, Museum Aan de Stroom which means the museum at the stream. Antwerp has one of the largest sea ports in Europe, but I'm still a little surprised when I see boats. No sea in sight yet so many boats! We then headed to the sample sale. After having spent 2 hours in what felt like a whirlwind racks and racks of clothes, slightly agitated women and a large chaotic changing room, we decided to get outta there. We walked back and passed the cathedral..
.. and had a little look at Dries Van Noten's SS13 collection in his shop 'Het Modepaleis' - the fashion palace. 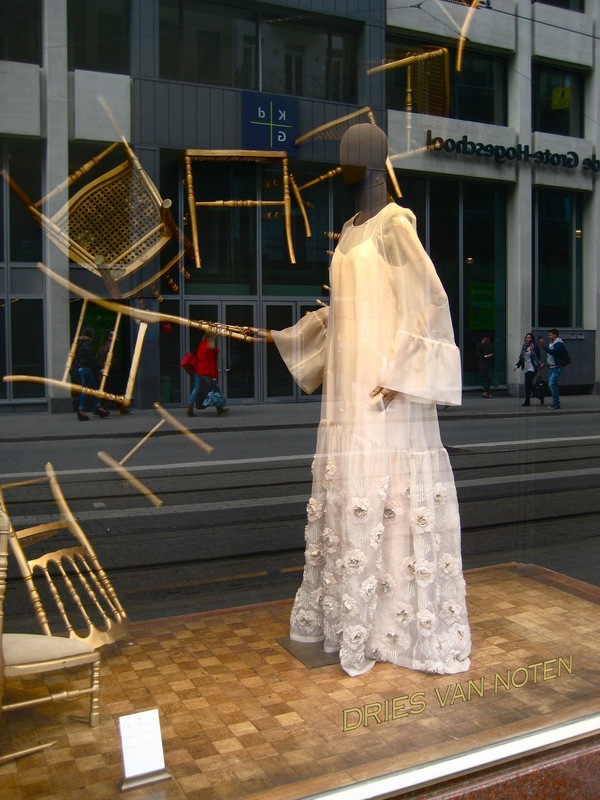 You must definitely pay a visit to this shop when you're in Antwerp, even if it's only to to check out the shop windows, which are transformed into works of art each season. Around this very fashion-area you'll find lots of cool independent boutiques as well as the fashion museum MoMu, a little further down the Nationalestraat. 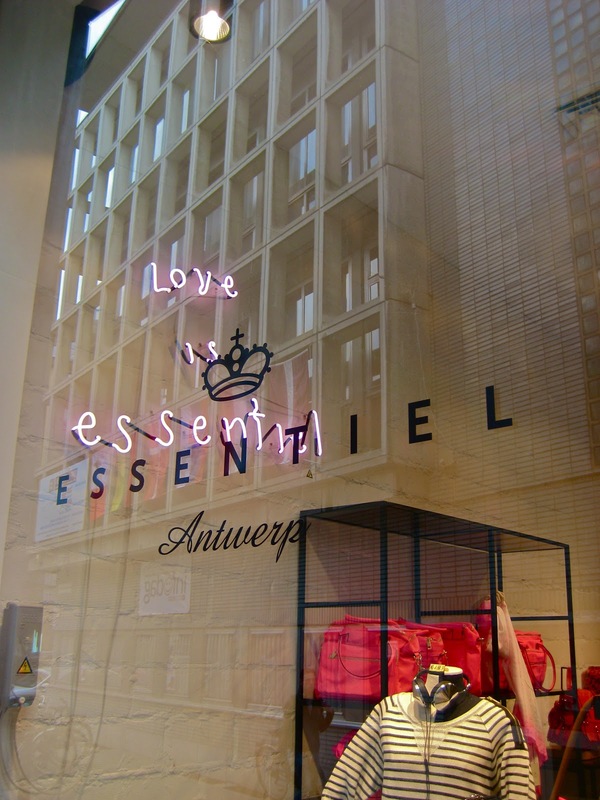 We took a turn at Lombardenvest, where you can find boutiques like Step By Step with brands like Isabel Marant, Alexander Wang and 3.1 Phillip Lim. You can recognize this store by all the Barbie dolls lined up at the entrance. The small but nice Acne store..
And finally Louis on the corner, where they sell Balenciaga, Ann Demeulemeester, Rick Owens and Lanvin. We spotted these cute Yes/No loafers at Essentiel, another brand founded in Antwerp. The Essentiel shop on Lombardenvest consists of an accessories part and a clothing part. Look at all the bright neon colours! A few meters further you'll find on of my favourite boutiques, Enes, where you can find brands like Filles a Papa, See By Cloé, J Brand, Wildfox, Iro and so on. Wooden floors, large changing rooms and a relaxed atmosphere make the store so lovely! My next favourite is Monar, a shoe store where they sell Minnetonka, Converse, New Balance, Sam Edelman, UGG Australia and Havaianas. Can you spot the Lola Cruz boots I bought last summer in the right corner? I already had to bring them to the shoemaker because I wore them nearly every day this winter! I definitely recommend the boots as well as the store. Look at those fun cotton bags! At the end of Lombardenvest, we took a turn to the right into Korte Gasthuisstraat where you'll find more chocolate shops, boutiques and COS.
Then we went into the small shopping gallery, Nieuwe Gaanderij, where you'll find Meeussen, a shop where I always stop and look at the great selection of sunglasses. Right nextdoor you'll find Cosmeticary, a beauty boutique where you can find more unique brands like Diptique (this is where I bought Philosykos), OPI, Ren, Dermalogica, Clean perfumes, Bumble and Bumble and Laura Mercier. Then we went on to one of my favourite streets in Antwerp, Schuttershofstraat. You'll find the creme de la creme here: shops like Gucci, Hermes, Burberry, Maje, Princesse Tam Tam, BCBG, Jimmy Choo.. everything you can wish for! Coccodrillo might be the most well-known shoe-shop in town. Here you'll find a selection of the latest designer shoes for women. Right opposite this store you'll find the men's store. 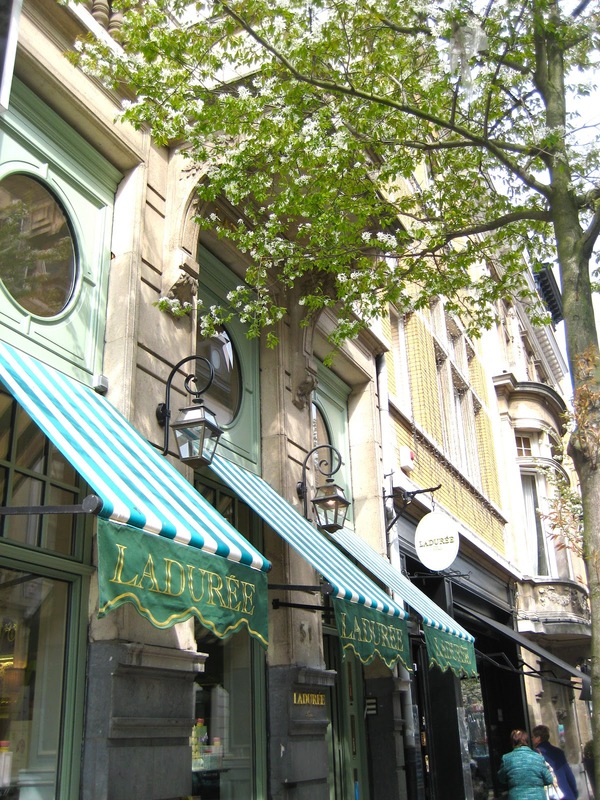 Near the end of the street you'll find the new Laduree shop, the first in Antwerp. Doesn't it look beautiuful? We almost felt like we were walking around St. Germain in Paris! After all that lusting we decided to call it a day and headed to Antwerp Central Station, a real landmark. Many people agree that it's the most beautiful train station in the world, so you can't miss it whilst visiting Antwerp! 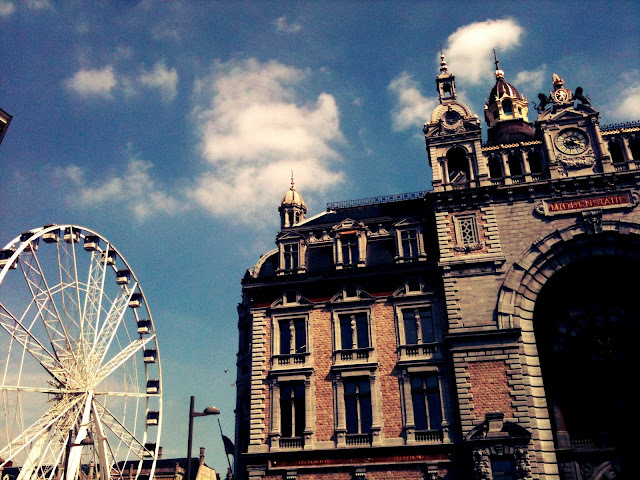 Behind the ferris wheel, to the left of the station you'll find Antwerp zoo, one of the oldest zoos in the world. 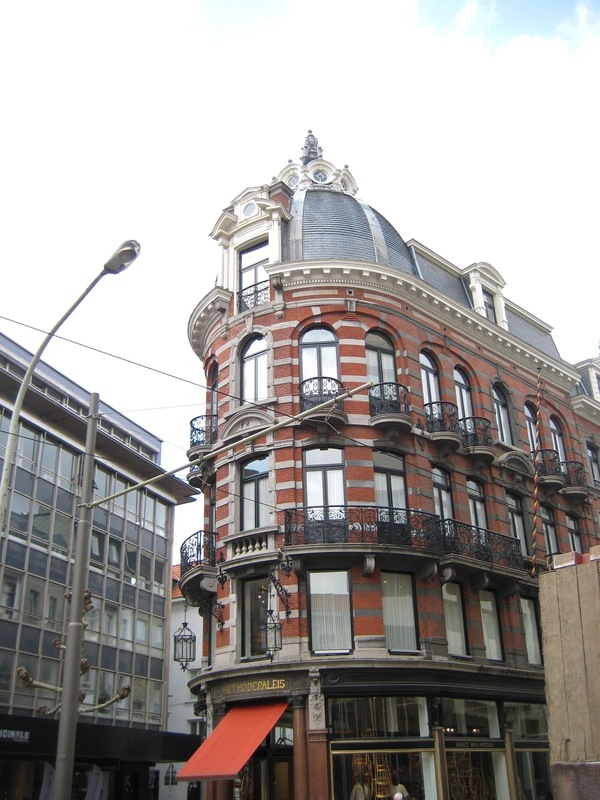 I felt like a real tourist taking so many photos in Antwerp, but I really wanted to show a bit of Antwerp to my readers who have never been there. It's a lovely city with lots of things to do, and definitely a must-visit for anyone who likes shopping. I think besides London and Paris, Antwerp is a great city for a long weekend city-trip!